The values here are estimates adapted from references 1-6 by taking a consensus or averaging where appropriate. 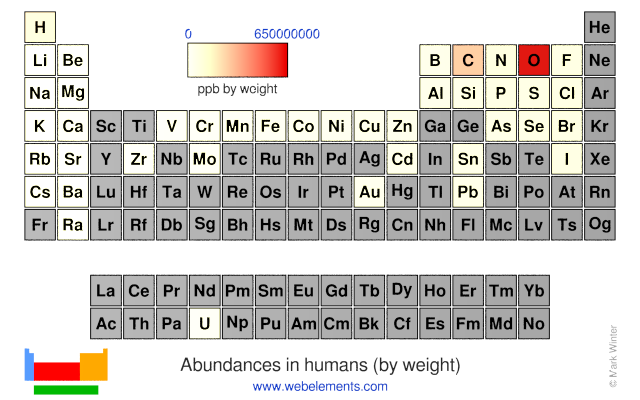 For ease of comparison with other abundance values, all abundance data in WebElements have been scaled to parts per billion (ppb), both as ppb by weight and by number of atoms. Values for less common elements should be treated with some caution and none of the data is better than one or sometimes two significant figures. Values for any individual human will depend very much upon that individual's local environment. For instance, if you live near a major road in a country where leaded fuel is still sold, you are likely to have more lead in you than the average. 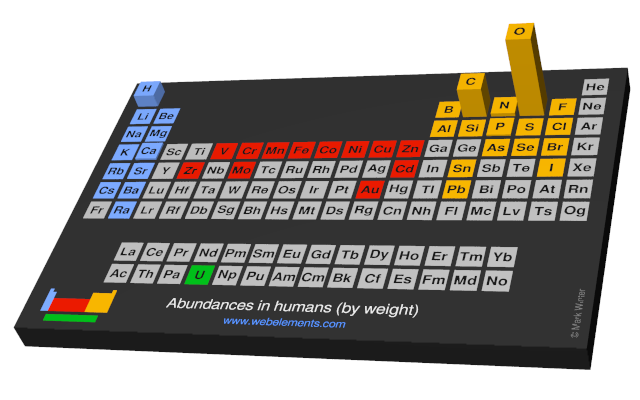 Image showing periodicity of the chemical elements for abundances in humans (by weight) in a periodic table cityscape style. Image showing periodicity of the chemical elements for abundances in humans (by weight) in a periodic table heatscape style. 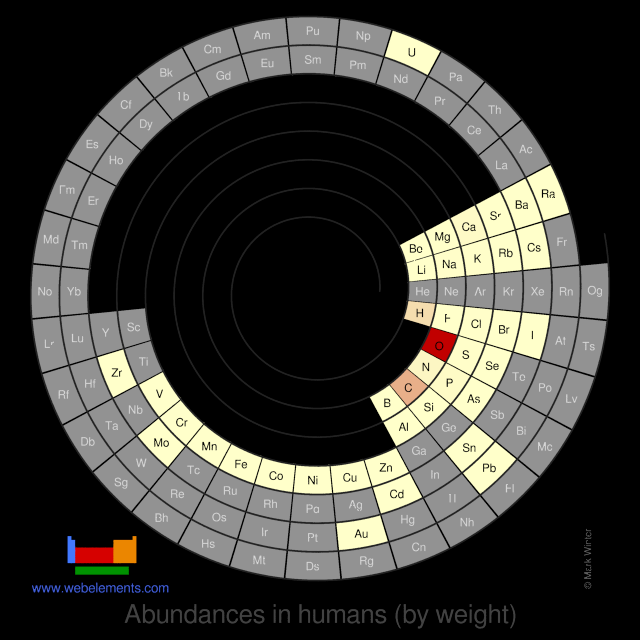 Image showing periodicity of the chemical elements for abundances in humans (by weight) in a spiral periodic table heatscape style. 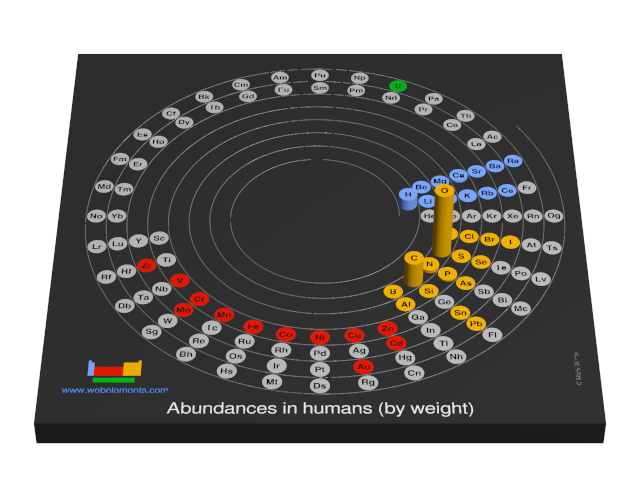 Image showing periodicity of the chemical elements for abundances in humans (by weight) in a 3D spiral periodic table column style. 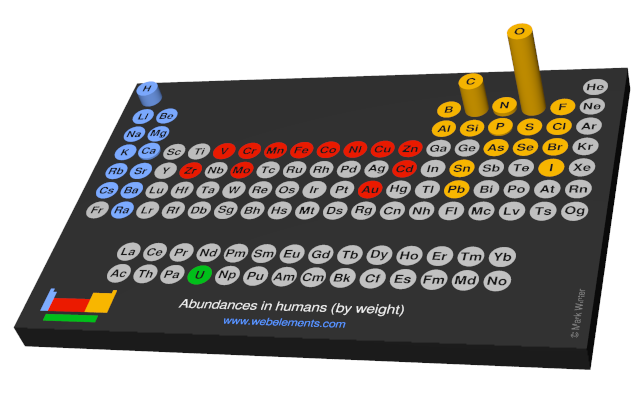 Image showing periodicity of the chemical elements for abundances in humans (by weight) in a 3D periodic table column style. I.S. Butler and J.F. Harrod in Inorganic Chemistry, Principles and Applications, Benjamin Cummings, California, USA, 1989.